This work was a collaboration with colleagues at Center of Excellence for Sport Science and Coach Education, in East Tennessee State University. Repeated change-of-direction test for collegiate male soccer players. Mizuguchi S1, Gray HS, Calabrese LS, Haff GG, Sands WA, Ramsey MW, Cardinale M, Stone MH. 1Center of Excellence for Sport Science and Coach Education, Department of Kinesiology, Leisure, and Sport Science, East Tennessee State University, Johnson City, TN, USA – harahara10@hotmail.com. The aim of the study was to investigate the applicability of a repeated change-of-direction (RCoD) test for NCAA Division-I male soccer players. The RCoD test consisted of 5 diagonal direction changes per repetition with a soccer ball to be struck at the end. Each player performed 15 repetitions with approximately 10 seconds to jog back between repetitions. Data were collected in two sessions. In the first session, 13 players were examined for heart rate responses and blood lactate concentrations. In the second session, 22 players were examined for the test’s ability to discriminate the primary from secondary players (78.0 ± 16.1 and 10.4 ± 13.3 minutes per match, respectively). Heart rate data were available only from 9 players due to artifacts. The peak heart rate (200.2 ± 6.6 beats∙min1: 99.9 ± 3.0% maximum) and blood lactate concentration (14.8 ± 2.4 mmol∙L1 immediately after) resulted in approximately 3.5 and 6.4fold increases from the resting values, respectively. These values appear comparable to those during intense periods of soccer matches. In addition, the average repetition time of the test was found to discriminate the primary (4.85 ± 0.23 s) from the secondary players (5.10 ± 0.24 s) (p = 0.02). The RCoD test appears to induce physiological responses similar to intense periods of soccer matches with respect to heart rate and blood lactate concentration. Players with better average repetition times tend to be those who play major minutes. I have been reading in the last two days the very recent review from Martin Gibala on high intensity interval training (HIIT) and its effectiveness on health and disease. This is an excellent review paper which shows how effective this training modality is as well as how efficient it is, considering that gains can be obtained with a lot less time than conventional aerobic exercise modalities. Considering the body of knowledge so far accumulated on the beneficial effects of high intensity exercise, sometimes I wonder why I still see team sports players spending precious training time on an athletics track running 1000 meters and above. Evidence suggests that when compared on a matched-work basis or when estimated energy expenditure is equivalent, HIT can serve as an effective alternate to traditional endurance training, inducing similar or even superior changes in a range of physiological, performance and health-related markers in both healthy individuals and diseased populations (Hwang et al 2011; Wisloff et al 2007). Growing evidence suggests also that low volume HIT stimulates physiological remodelling comparable to moderate-intensity continuous training despite a substantially lower time commitment and reduced total exercise volume (Gibala & McGee 2008). In fact, many authors found similar training-induced improvements than conventional endurance exercise in various markers of skeletal muscle and cardiovascular adaptation despite large differences in weekly training volume (~90% lower in the HIT group) and time commitment (~67% lower in the HIT group). In addition to an increased skeletal muscle oxidative capacity, other endurance-like adaptations have been documented after several weeks of low-volume HIT include an increased resting glycogen content, a reduced rate of glycogen utilization and lactate production during matched-work exercise, an increased capacity for whole-body and skeletal muscle lipid oxidation, enhanced peripheral vascular structure and function, improved exercise performance as measured by time-to-exhaustion tests or time trials and increased maximal oxygen uptake (Burgomaster et al., 2005; Burgomaster et al. 2008; Gibala et al. 2006; Rakobowchuk et al. 2008). The protocols used are pretty similar. Here is a summary table. The results are of course pretty impressive and compare well with conventional endurance exercise. In Burgomaster’s et al. study (2008), VO2peak increased after training, with no difference between groups (HIT vs. conventional aerobic (ET)). Peak power output elicited during the Wingate Test increased by 17% and 7% in the HIT and ET groups, respectively, with no difference between groups, whereas, mean power output was increased by 7% only in the HIT group. ET consisted of continuous cycling on an ergometer, 5 days per week (Monday–Friday) for 6 weeks, at a power output corresponding to ∼65% VO2peak. Subjects performed 40 min of exercise per training session for the ﬁrst 2 weeks. Exercise time was increased to 50 min per session during weeks 3 and 4, and subjects performed 60 min of exercise per session during the ﬁnal 2 weeks. 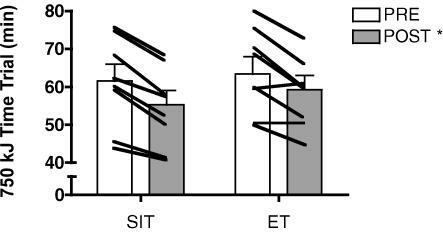 Time trial improved more in the HIT group (SIT in the figure below) when compared to the ET group (6 sessions of sprint interval training (SIT) or endurance training (ET) over 2 weeks). The ET group performed training consisted of 90–120 min of continuous cycling at an intensity corresponding to 65% of VO2peak. Training progression in the ET group was implemented by increasing the duration of exercise from 90 min during sessions 1 and 2, to 105 min during sessions 3 and 4, and finally to 120 min during sessions 5 and 6. Considerable evidence currently exists to support a role for low-volume HIT as a potent and time-efficient training method for inducing both central (cardiovascular) and peripheral (skeletal muscle) adaptations that are linked to improved performance and health outcomes. However few things should be considered when prescribing training programmes involving high-intensity training. 1) HIT requires “all out” supramaximal efforts followed by low intensity efforts. If you prescribe a programme asking your athletes to sprint at “60% of their max” or anything like that, they are not performing high intensity interval work. 2) Maximal means “all out”, I see too many “interval sessions” with intensities below 100% of an athlete’s max. 3) Adequate recovery is needed and workloads planned should take into account the ability of the individual involved. 4) Heart rate and blood lactate monitoring will provide you with the necessary information to be able to manipulate sets vs reps as well as recovery protocols, as well as giving you feedback on how your athlete/client is progressing.